The philosophy of Our Savior Preschool and Pre-Kindergarten stems from the belief that the home has the primary responsibility for the young child’s physical, social, and spiritual development. To assist parents with this responsibility, our three and four year old classes provide a structured environment in which the children learn and develop social skills and are nurtured in their spiritual growth through the study of the Bible. 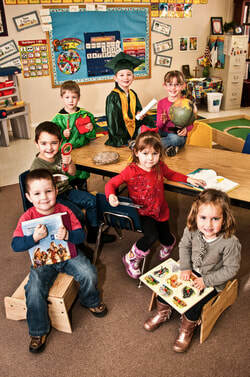 The Preschool and Pre-Kindergarten curriculum is intended to guide the children in a progression of skills related in the following areas: knowledge of Holy Scripture, language, mathematical reasoning, number sense, orientation in time and space, scientific reasoning, music, visual arts, movement and coordination. Consequently, the Preschool and Pre-Kindergarten programs are an introduction and foundation for the classical education the children will receive at Our Savior Lutheran School in grades Kindergarten through 6th. Our Savior Lutheran Preschool is a place where children laugh, sing, play and run. The environment is designed to stress sharing and caring. It is structured, yet within the structure there is freedom. Children can express feelings and experiment with many different learning challenges. would like to do and learn through discovery and play. well as interaction among the children.